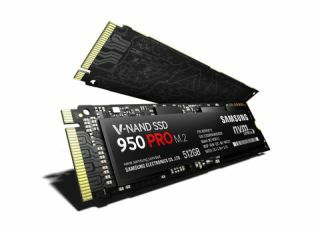 Samsung has announced the 950 Pro solid state drive, which marks an important transition for Samsung from advanced host controller interface (AHCI) to non-volatile memory express (NVMe). As SSD technology moves to PCIe from SATA, enabling faster speeds, the NVMe interface provides the necessary bandwidth to keep up. The 950 Pro is Samsung’s first consumer ready example. It's an M.2 form-factor SSD using Samsung's vertical NAND, with read speeds hitting 2.5 gigabytes per second. The 950 Pro features PCIe 3.1 interface support, which improves random and sequential performance when compared to SATA drives. Samsung says that users will experience up to four times faster performance than traditional SATA SSDs. The 950 Pro will be available in 512GB and 256GB capacities, with a 1TB model coming in 2016. The 512GB version offers read/write speeds of up to 2,500/1,500 MB/s, with random read performance up to 300,000 IOPS, and write speeds up to 110,000 IOPS. It consumes 5.7W of power on average. As is typical with SSDs, the smaller capacity drive is a bit slower. The 256GB version has read/write speeds of up to 2,200/900 MB/s, random read performance of up to 270,000 IOPS, and random write speeds of up to 85,000 IOPS. Both versions come with a 5-year limited warranty of up to 200 TB written for the 256GB, and 400TB for the 512GB version. Samsung says that both versions will be out in October, with the 512GB version costing $350, and the 256GB version costing $200. You can get the 512GB 850 Pro right now on Amazon for quite a bit cheaper at $231, so you’ll have to make the choice between the newer technology and price. Hopefully a storage heavyweight like Samsung moving to NVMe will drive more companies to move to NVMe, and in turn start to bring prices down. The 512GB 950 Pro is notably cheaper than Samsung’s SM951, which packs a heavy punch but is quite hard to find in stock at retailers at the moment.